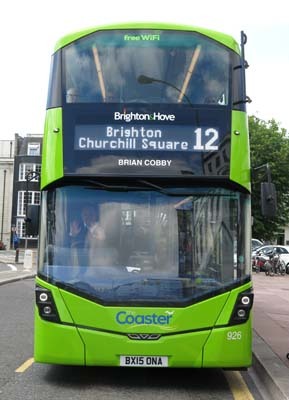 Connections with Brighton and Hove : Brian Cobby was an actor who had one of the best known voices in Britain. In 1984 he was the first man to become the voice of British Telecom’s speaking clock service which used to receive up to 300 million calls a year. Cobby, who lived in Brighton, described himself as Britannia's wristwatch. He replaced Pat Simmons, whose voice had been used since 1963. She was on the panel of judges that selected him alongside the actors Robert Morley and Susan Hampshire. At the time he was working for BT at Withdean and was one of 5,000 staff nationwide who entered the contest. For winning it he received £5,000. Women had provided the voice since the service started in 1936 and the other finalists were all female. His voice lasted 22 years until BT decided to replace it with that of Sara Mendes da Costa. He said: “A good voice ought to have warmth, clarity and sometimes authority.” Cobby fared well when commercial television started in the 1950s in Britain, voicing commercials for Stork margarine and Surf washing powder. But his acting career declined and he took a job as a night supervisor at Withdean. He was a child chorister at City of Oxford High School for Boys before becoming an actor. He appeared in repertory and open air theatre. Cobby died in 2012 aged 83, following a series of health problems. 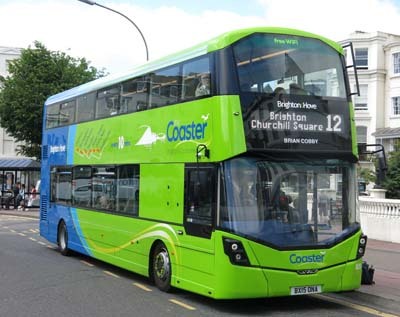 926 Mercedes Streetdeck - carried name since delivery in March 2015 on Coaster Route 12.